Aight y’all. Things are about to get real around here. Fo rizzles. For real. Last night when I was making this soup, I forgot to “blog it.” Forgot to take pictures of the process and pretty pictures of the final product. Instead, here’s what dinner really looks like. No, we don’t actually eat most meals at our schmancy dining room table with coordinated place mats. Most meals are consumed on our super classy As-Seen-On-TV Table-Mate trays (which we LOVE, by the way!) in front of our TV in the loft. Once dinner was in place and Netflix was ready to go (we are watching Season 1 of 30 Rock), I remembered to snap a few quick pictures. This soup was so amazing that I just had to share it on the blog, even though the photos aren’t the prettiest. 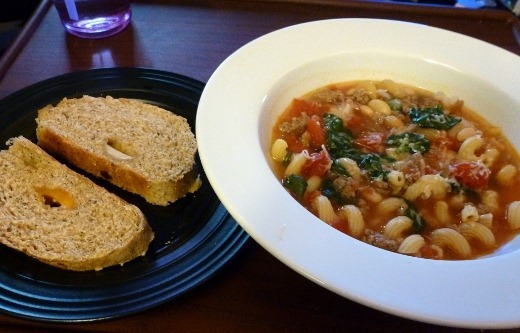 This recipe has to be, at least, in my top three favorite soups I’ve made, ever! (And I make A LOT of soup.) The best part is how quickly and easily this comes together. It’s also relatively inexpensive to make, as many of the items are budget pantry items like canned beans and tomatoes, and pasta. The only real labor required is to brown and drain 1/2 lb Hot Italian Turkey Sausage, and chop and sauté onion and garlic. Then, throw in the remaining ingredients (broth, water, pasta, canned tomatoes, canned white beans), and let the pot simmer for about 10 minutes, until the pasta is cooked. 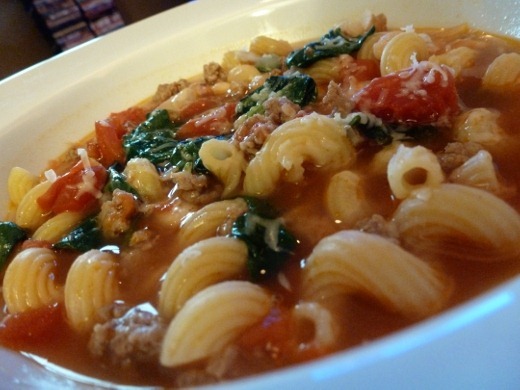 I used cavatappi pasta instead of elbow macaroni and loved it! It’s my new favorite pasta shape. Just before serving, I added a few big handfuls of spinach leaves to the pot, and allowed them to wilt. I topped the soup with grated Parmesan cheese, and served with yummy Four Cheese Great Harvest Bread. (This bread was utterly deee-licious and I can’t wait to buy more, but I was a little sad I wasn’t offered a sample when I went in the store this week!). 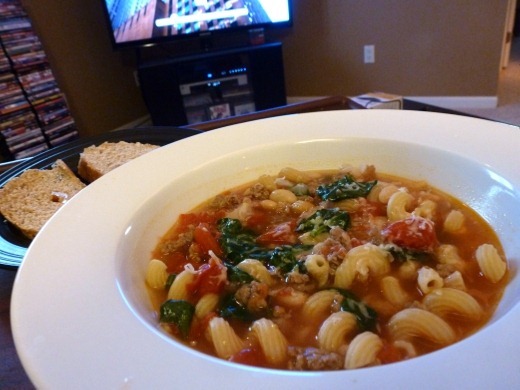 Go find the Pasta Fagioli Soup recipe at Taste of Home! Currently listening to: Dull Life – Yeah Yeah Yeahs. Pingback: Meal Planning for Week of August 11-17 « Meg.Goes.Nom.Nom.